Canon's VIXIA HF R10 Dual Flash Memory Camcorder is an entry-level HD camcorder with numerous features and functions to help you with the recording process every step of the way. The HF R10 captures 1920 x 1080 HD video to an internal 8GB flash memory or to SD/SDHC memory cards, including Eye-Fi SD memory cards. In addition to recording MPEG-4 AVC/H.264 video, the HF R10 also captures 2MP digital stills. At the core of the HF R10 you'll find a Genuine Canon 20x HD Video Lens, a 2.39MP HD CMOS Image Sensor, and Canon's DIGIC DV III Image Processor. Other features, like 20x optical zoom, Dynamic Image Stabilization, and a 2.7" LCD give you the tools you need to record your video with accuracy. Among the numerous user-friendly applications of the HF R10 you'll find 24p and 30p recording. 24p gives your video a film-look, while 30p is ideal for shooting action footage and posting to social networking sites. Other beneficial applications include Face Detection, Quick Start, and Pre-Record modes. And last, but certainly not least, the HF R10 features microphone and headphone connections for recording quality audio using an optional external mic and headphones. The VIXIA HF R10 allows you to record up to 3 hours of video to an 8GB internal flash drive or to a removable SD memory card. With Relay Recording, the camcorder automatically switches video recording from the internal drive to the SD memory card when the memory becomes full. There's no need to worry about running out of recording time during a thrilling, once-in-a-lifetime shot. You'll also have the flexibility of copying video from your VIXIA HF R10's internal drive to the removable SD memory card. That makes it easy to insert the card into your computer or HDTV's card reader and view your recorded footage immediately. The VIXIA HF R10, in addition to being a camcorder, is also a digital camera. The VIXIA HF R10's Dual Shot makes it easier than ever to capture both video and photos. Shoot up to 3 frames per second in the Continuous Mode, or a blazing 5 frames per second in the High Speed Continuous Mode. The versatile VIXIA HF R10 even lets you capture a still image from an already recorded movie. While playing the movie in your camcorder, simply press the photo button to capture a 1920 x 1080 photo onto an SD card or to internal memory. Additionally, the VIXIA HF R10 allows you to capture 30 photos from one second of video. The same Face Detection technology used in Canon digital cameras is available in the VIXIA HF R10 high definition camcorder. Up to 35 faces can be tracked automatically, ensuring razor-sharp focus and natural, accurate exposure. Of the faces tracked, 9 detection frames can be displayed at one time. The system is in fact so smart that it will recognize faces turned downwards or sideways. 24p Cinema Mode enables all aspiring moviemakers to achieve a professional "film-look." You can change the camcorder's frame capture rate to 24p (recorded at 60i), which provides the appearance of the same frame rate as movie film. In addition, you can use the VIXIA HF R10's CINE setting, which changes the color and tonal characteristics, evoking the look and feel of a movie shown in a theater. For added flexibility, these settings can be used together or independently. VIXIA HF R10 Dual Flash Memory Camcorder (Black) is rated 4.3 out of 5 by 98. Rated 5 out of 5 by laserfloyd from Great for the price I went to this camera because it sported the external mic input but was affordable. Didn't almost all camcorders used to have those? Also the manual focus was nice. It's not a focus ring on the lens but it's nice to be able to turn manual on so auto-focus doesn't jump around. In the first real 'test' of this camcorder, I took it to a family outing for Easter. I shot video and honestly didn't expect much from it. I later edited it together loosely and slapped a soundtrack on it. Editing was a breeze as I just drag/drop the video into the timeline and have at it. 8GB built in memory gives about an hour of highest quality recording too. Not bad! I was actually pretty stunned at how good the video quality was. It blew my previous cam away (a little sony handheld). I had it playing on my big screen and it just looked great. And that was even the compressed version. I look forward to really putting it to work with some short video projects I have lined up. So, for the price and a couple of key features this is a great camcorder! Rated 3 out of 5 by Mike McD from Good deal at this price, but has flaws I bought this camera knowing about the audio issue (disc noise gets picked up by built-in mic) and intending to use an external mic with it. Without an external mic, in indoor and low-volume settings the built-in mic definitely picks up the disc noise and you will have that on your footage for sure. I use this camera as a 2nd camera for video shoots using an external lav mic or small shotgun mic and it's great for that. Video quality is good, and really as a 2nd or 3rd camera and at this price it's a bargain. Just be prepared to find some other solution for audio. The disc noise would be a deal-breaker for me if not for an external mic. Rated 5 out of 5 by Anonymous from Great HD camcorder, very versatile I use this for a few short films I've worked on, and family/school events. However, though this is a great product, there are two things you should know. 1. The auto-focus mechanics make some small amount of background noise. But it's not heard at all when a few people are talking or out in the street, etc. It's also very easy to remove in various sound editors. 2. It's effective pixel range is actually below 1920x1080 (full HD). However, footage still appears as such, and the upscaling is almost not at all apparent. Despite that, this is an excellent camcorder that records stunning HD video. The only other downside you'll find is with battery life (which is to be expected). For that, just purchase an extra battery and a external charger (if you want to be efficient). Rated 4 out of 5 by Flying Man from Very nice to travel with! I am taking this to travel to India. It is tiny- I was shocked at how small it is. However, the video quality is excellent, and even quite decent in low light...a big deal for me. The zoom works well and image stabiization is decent as well. The zoom button could be a bit better placed but works well enough...just a bit awkwardly placed. The housing could also be metal instead of plastic. It would be heavier though more solid and durable. Get an extra battery though...they do not last like camera batteries. Overall, this one is hard to beat at this price-point, and an excellent choice. The clear LCD is an added bonus. Rated 4 out of 5 by Dhiego Almeida from Good camera for the buck I bought this camera for my dad but I had used it for 2 weeks before gave to him. It's a great camera from a greater brand. It's light a easy to use and set up, the Movie Quick Mode is awesome and let you have the best image quality in just a few clicks. The HD image is good when you shoot in good light and a little bit grainy in low light places. I shot some scenes at beach and the colors are bright and vivid, and the Easy Beach Mode works great to. I imported the videoclips in iMovie easily and in HD quality. I would recommend this camera to family purposes but not if you want to do something more because it lacks the hot shoe and can't use lens adapter with it. 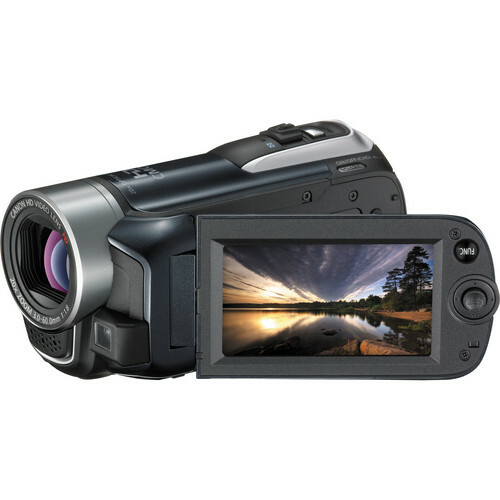 Rated 5 out of 5 by Anonymous from VIXIA HF R10 In the Classroom The Canon VIXIA HF R10 will be the camcorder of choice for our speech communication faculty who video-record all students' oral presentations. The HD videos have vivid color and the audio picks up speeches and lectures with excellent clarity even without using the excellent option of an external microphone which will only add to the quality of audio recorded. Because the camcorder fits neatly into the palm of your hand, it is discreet, and attractive, almost a conversation piece, making it enjoyable for both the person recording and students' video-recorded. After many years of video-recording in the classroom, and, because of the excellent price, this will be the camera our school will use in the Fall of 2010 for all faculty in our speech department. Rated 4 out of 5 by YESFILMS from Canon made some mistakes I really tried to love this camera. Imagine...HD w/mic & headphones input. These features are great specially when you travel and want to check your footage privately & to do interviews (mic). One HUGE let down is that it does NOT have a FILTER SIZE...meaning you can't adapt a wide angle lens. I own a $130 wide angle adapter which I ended up not being able to use. The image is decent. The Image Stabilization should have been OPTICAL...specially coming from CANON...a company that makes good lenses! CANON has a tendency to make many cameras that are 1 or 2 features short of being GREAT! This is NOT good.